This web component is composed of a tree widget that contains the list of registered data managers that are the top level nodes. Icons can be be associated with each node to visually distinguish between data managers. Three types of actions can be initiated on a node. Expanding a node will initiate a query to the data manager that the node represents. This query is configurable by the application. For example, consider a "CBE" data manager. 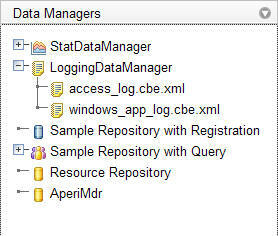 This data manager contains a repository of log files that have been collected from various applications. Expanding the node of the "CBE" data manager will submit a query to get the list of log files that the this data manager is aware of. As a result the user will see a list children nodes under the "CBE" data manager node. Note that expanding a node may result in different queries for different data managers. These queries are configurable at the application level. Right clicking a node will bring up a pop-up menu with a set of options. These options may vary from one data manager to the next. The types of options that are displayed in the pop-up menu are configured at the application level. 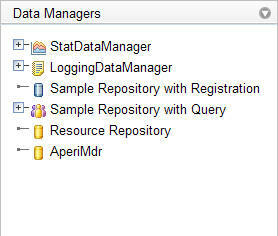 There are however some basic menu options that are available to data managers that are MDRs. 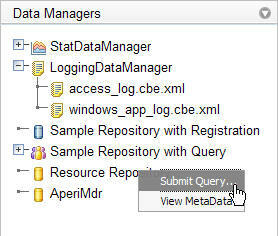 The user can select the Submit Query option to bring up a web component that will allow the user to construct a CMDBf query and submit this query to the MDR. These web components are further explained under the [Query] section. Selecting a node may cause a section within the application console to refresh. The section that is refreshed within the application as a result of selecting a particular node is configured at the application level. For example, an application console may be made up of this navigator component and the [properties] component. When the user selects a node in the navigator component the properties component is refreshed and shows the list of properties of the selected node in a table. This is illustrated in the following screen shot. Other types of nodes behave differently. For example, the navigation tree may have nodes that represent predefined CMDBf queries. CMDBf query nodes are children nodes of data manager nodes. When these nodes are selected the graph response view shows the results of the CMDBf query. 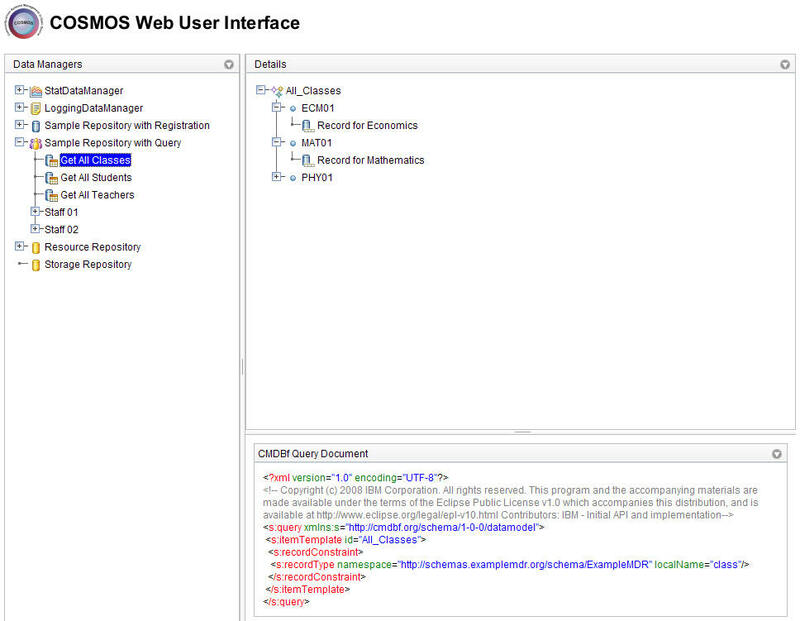 Also note that the properties view will show the CMDBf xml document. This page was last modified 11:43, 24 June 2008 by Sheldon Lee-Loy.